Trulia says rising home prices are negating some of the benefits of historically low mortgage rates. Miami took the top spot on the list of metros where it's financially smarter to buy than rent. Meanwhile, the benefits are slimmest in Honolulu, where it's only 17.3 percent cheaper to buy. Mortgage rates in 2016 have remained lower than anybody expected, but those near-historic low rates haven’t enticed near-historic numbers of homebuyers to take the plunge. What’s going on? New research from Trulia indicates that although mortgage rates are low, rising home prices are canceling out some of those low-rate benefits.
.@Trulia: Rising home prices are canceling out some of those low mortgage rate benefits. “For households who move every seven years and can afford to put 20 percent down, it’s 37.7 percent cheaper to buy than it is to rent this year. This up just slightly compared to 37.2 percent last year,” reads the report. This is especially true in each of the 100 largest metros, such as Miami, Ft. Lauderdale, Honolulu and San Francisco, where it’s 20 percent to 50 percent cheaper to buy than rent. But that’s not necessarily true for the rest of Americans living in smaller metro and rural areas. The average mortgage rate has dropped 0.2 percentage points over the past year, but that hasn’t made much of a difference for some would-be homeowners to make the jump from renting to buying. Nationally, home prices have risen 5.9 percentage points while rents have grown much slower, with a 3.5 percent increase from 2015. To put it in perspective, mortgage rates would have to more than double to negate the financial advantages of homeownership. Meanwhile, home prices would only need to rise 67 percent. In San Jose, home prices would need to go up a relatively small 24 percent for the cost of buying to be the same as renting, while mortgage rates would need to jump nearly twice that amount — 45 percent. Markets where it’s still advantageous to buy. The South — specifically South Carolina, Florida, Louisiana and Texas — came out on top of the list of best places to buy rather than rent. 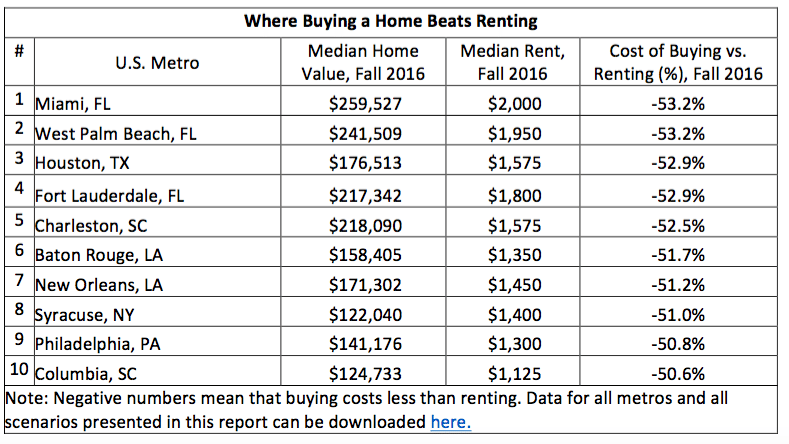 In Miami, seven years of homeownership is 53.2 percent cheaper than renting. Ft. Lauderdale wasn’t too far behind — it’s 52.9 percent cheaper to own. Syracuse and Philadelphia were the only Northeastern states to make it on the list at Nos. 8 and 9, respectively. 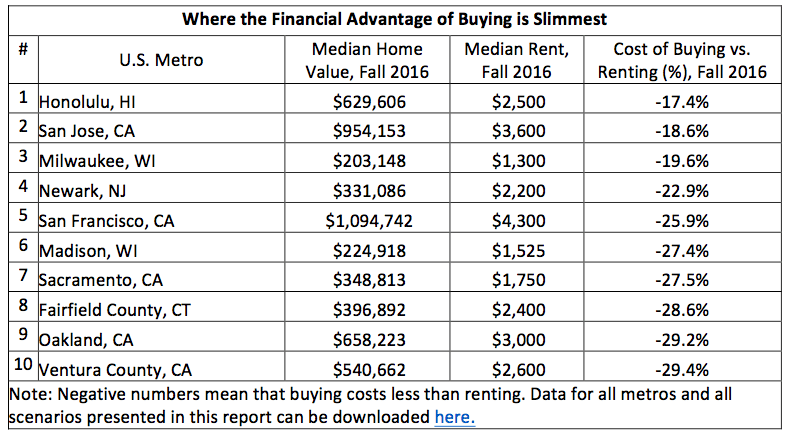 Metros with the slimmest financial advantage margins. On the other hand, would-be homeowners in the West and Northeast coasts will have a harder choice. In Honolulu, seven years of homeownership is 17.4 percent cheaper than renting — 35.8 percentage points lower than Miami, which is the top city for owning. What if the Fed increases rates? As seen in previous homeownership and housing market sentiment reports, buyers are waiting for the Federal Reserve to drop the gauntlet in December and increase the overnight exchange rate, which is likely to increase mortgage rates. But Trulia notes that even if the Fed does jack up rates, buyers still should be more concerned about rising home prices. Even if the Fed raises rates, buyers should be more concerned about rising home prices. 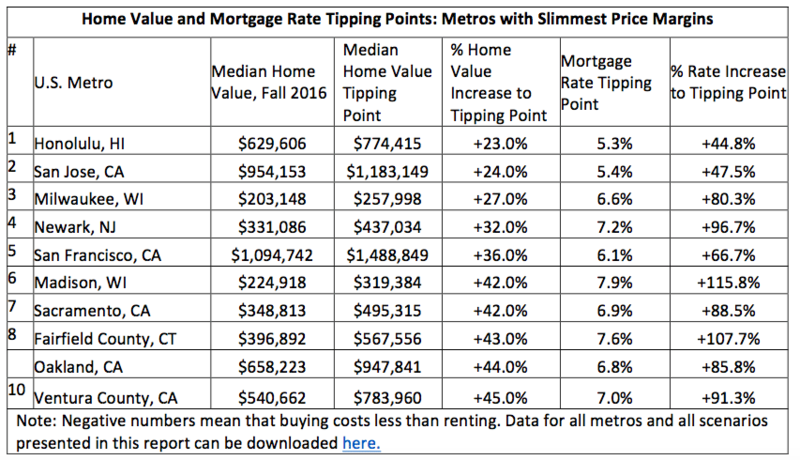 For example, the median home value tipping point for the U.S. is $467,772, which is 67 percent higher than today’s median value of $280,103. In comparison, the tipping point for U.S. mortgage rates is 9.1 percent, or 145 percent higher than today’s average mortgage rate of 3.7 percent. Trulia calculates the cost of buying versus renting with a quality-adjusted measure of home prices and rents. Is it time to start worrying about housing prices?